Josh is from the small town of Etowah, TN, where he grew up with two awesome parents and a pretty cool older brother. 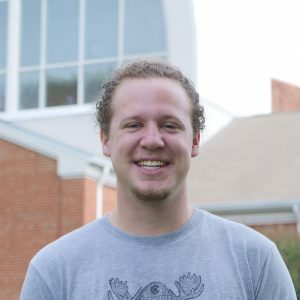 Josh joined Tyner UMC as the Director of Student Ministries in August 2017 after he graduated from Lee University with a degree in Youth Ministry. When not working at the church or schooling teenagers in a game of pick-up basketball, you’ll probably find Josh somewhere with his dog Fitz (who is super cute). As a senior in high school, Josh felt God calling him into ministry. As a result, Josh believes being loved by God and loving God is the greatest thing we can do in life, and being a part of the Church is a glimpse into the life of love and communion God desires for each one of us. Food: Oh man, probably pizza. Too many good foods out there. Food: Asparagus, Broccoli, Cauliflower, etc.